The night was just a little different from most nights. I knew that Ruben and I had date night that night, but I had no idea what was coming for me. I had plans with Ruben's sister, Lexi, to go shoe shopping to find wedding shoes. Honestly, the shoe shopping was a 100% bust. We found nothing! But we also found other things to shop for. I'm going through the temple (learn more about LDS Temples here) the following Friday, and I needed to get some things to help prepare me for that. I kind of thought that maybe that night would be the night that Ruben would propose, but Lexi was on her A-Game. 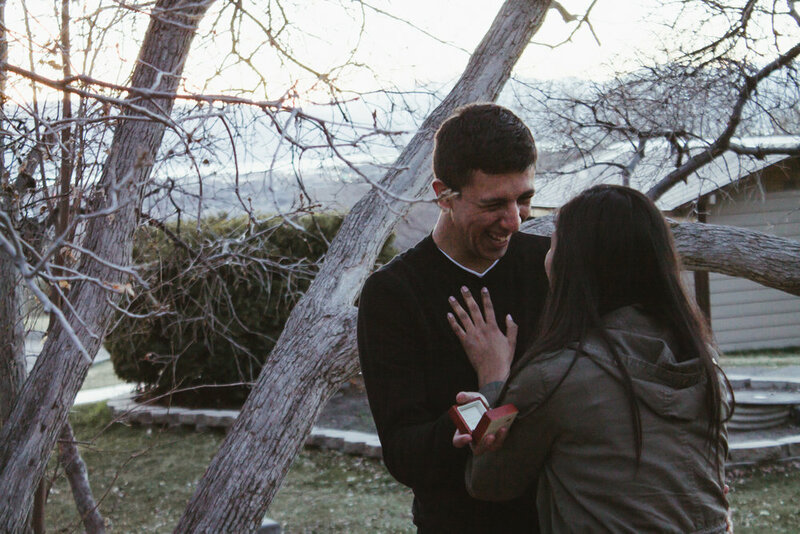 As we were buying things at Deseret Book, she kept on saying that Ruben was frustrated because the ring was taking a lot longer than he anticipated and he was just as anxious to propose as I was for him to propose. We were on our way back to Provo, but Lexi was taking a little different route to drop me off. She told me that she needed to pick up stuff from her bishoprics house for her calling and that he lived by Rock Canyon Park. We got a little lost and we took a turn down a road I knew there were no houses on. I figured we would just do a U-turn and go back towards the houses. But as we got to the top of that little turn off, I saw Ruben. I sat in the car for a good minute. I could not believe it was actually happening! Lexi had to tell me to get out of the car before I moved an inch. I got out of the car and walked towards Ruben (he claims that at this point I said "I hate you," but I'm 99% sure I didn't). He had recreated our first date with the same picnic blanket, bottled sodas, and added lights and pictures we had taken since freshman year together. I honestly can't even remember exactly what he said; I was shaking and in complete shock that after weeks of planning, it was actually happening. But he got on one knee and asked me to marry him. I, of course, said YES! And it was the best day of my life to date. My two best friends were there and two of his sisters were there. I think I said, "We're engaged!" and did a happy dance at least 239 times that night. Here's to eternity!